Everybody’s got an eel story in New Zealand. When we were kids we used to go eeling, digging what Dad called a “Maori eel trap” – a trench next to a lakeside or stream, dug long and thin enough for an eel to swim up with some meat in some pantihose staked to the top end. The idea was, the eel would swim up into the trench after smelling the meat and then, not being able to swim in reverse, remain stuck there. However, the more I’ve learnt about our native eels, especially their amazing life cycle, the less inclined I’ve been to eat them or hunt them ever again. What I didn’t know then is that our native longfin eels – the real big ones with a long dorsal fin (about two-thirds the length of their body), is that they’re found only here in New Zealand, and that they can live for 100 years. 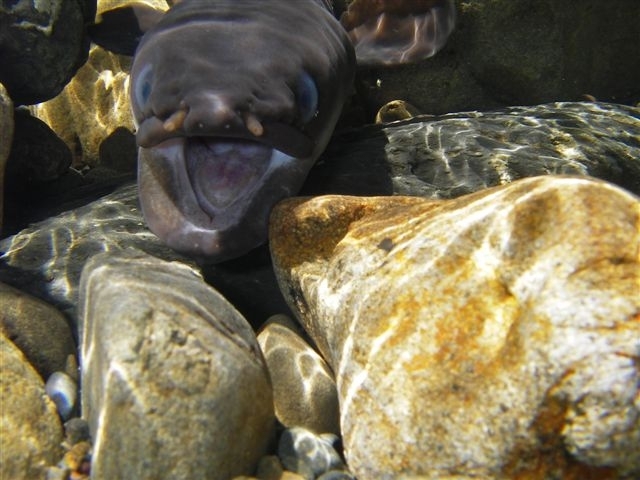 That in itself is pretty amazing stuff, but then I learned that longfin eels (which have been populating New Zealand’s rivers, streams and lakes for 23 million years) breed only ONCE in their lives. This breeding event is in itself pretty spectacular, since they swim to a mysterious place – thought to be off the coast of Tonga somewhere – breed and then die. That’s one helluva holiday romance! If that in itself doesn’t impress you, than think of what happens next. The tiny leaf-shaped, see-through eel larvae drift all the way back to New Zealand making their way into our rivers and sometimes swimming hundreds of kilometres upstream. The little eels are fantastic rock climbers, and vertical waterfalls are conquered with ease by these extreme freshwater fish. But despite all their tenacity, the longfin eels are doing it pretty hard these days. First, many of their habitats have been modified or destroyed. Large dams are a problem, either trapping the mature eels at the top or being too vast for the elvers (young eels) to climb up. Many freshwater streams, lakes and rivers have become severely polluted, making the water quality too poor for eels to thrive in. Eels have always been an important source of protein in New Zealand, but a commercial fishery has added to their problems. Now longfin eels are listed in the same threatened species category as blue penguins. Recently I discovered that not only are New Zealand’s longfin eels disappearing through far too many being caught in the commercial fishery, but they are mashed up into tinned dog food for pampered pooches in the United States. Is that any way to treat our ancient taniwha? For Maori, they are a significant cultural resource – and the myriad ways early Maori caught eels in New Zealand are fascinating. It seems people have always held a fascination with our eels. When we were kids we knew that on rainy days on my Nana’s farm in the Catlins, the eels could wriggle across the paddocks, and we used to feed a tame duck called Hoppy on camping trips to Frankton, who’d lost her foot to an eel as a duckling. More recently, my Dad in Christchurch and Mum in Dunedin have had pet eels in creeks next to their houses. These eels were well fed, getting anything from leftover roast chicken to mince. After the earthquakes in Christchurch, my Dad was really gutted that the liquefaction had come up through the stream at their house and he never saw his three pet eels again. These days, it seems that more and more people are interested in feeding and watching eels rather than catching and killing them, and for these ancient river guardians, that can only be a good thing. What about you guys? Do you have eel stories you want to share? If you want to help save the Longfin eel, join our petition to put a moratorium on commercial fishing of this endangered species.